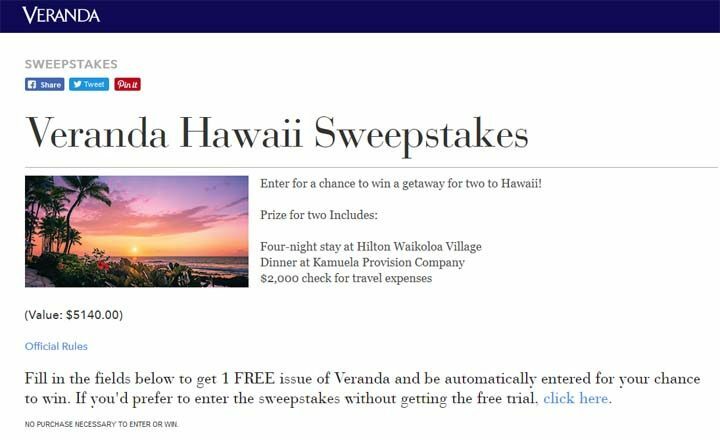 The Veranda Hawaii Sweepstakes is only open to legal residents of the 50 United States and the District of Columbia, who have reached the age of majority in their state or territory of residence. The Veranda Hawaii Sweepstakes ends on August 28 at 11:59 PM (ET). To enter, entrants must visit hawaii.veranda.com to complete the entry from. Limit one (1) entry per person. One (1) Winner will receive a four-night getaway to Hawaii for Winner and one (1) guest. Prize includes a four-night stay at Hilton Waikoloa Village (ARV: $2,940), dinner for two at Kamuela Provision Company (ARV: $200), and a $2,000 check which may be used for transportation or to use otherwise at Winner’s sole discretion (ARV: $2,000). Total ARV of prize package: $5,140.